Spent an hour this morning cleaning off a large book shelf, a well built book shelf, ca. 1976. Deciding what to discard, keep, and give away was a challenge such that the thought of drastically downsizing into a retirement flat is a horror nearly beyond comprehension. But you do find good things too, like pictures from long ago. 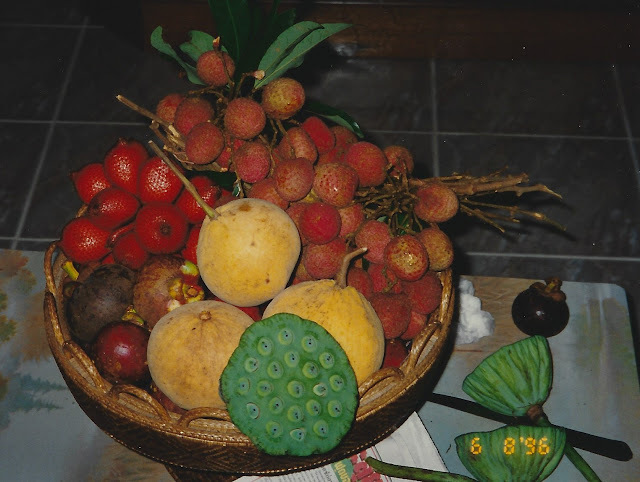 Here's a nice basket of tropical fruit, a gift on a trip to Thailand some 30 years ago and we still have the basket. See if you can identify all five of the fruit. And tell us how many you've actually eaten. Note in one case the seeds are eaten and the fruit discarded. I'm not sure of all of them, but I figure if I post a comment, I'll be able to find out what I've missed. Looks like lychee, mangosteen, and lotus. You've got 3 of the five. Good job! At the time I took the picture I didn't know the immature lotus seeds were edible. The other two are longan and guava (I think?). I've had all five, very tasty but hard to pick good mangosteen. Well, Colin you missed on those. The large round yellowish fruit are white sapote, and from the outside, guava isn't a bad guess, but in Thailand they eat their guava green, both in color and unripe (white, hard, flesh). The other fruit to the upper left are called snake fruit in English or salak, a palm fruit (you can tell by all the scales, thus the name snake fruit). Sort of a thin, tart, puckering flesh around a central pit. I have tried lychees. I like those. I lived in Korea for a while. I recognize the lotus plants. I have eaten the roots in Korea. They had some sticky sauce on them and sesame seeds.